Beto O’Rourke’s presidential campaign thus far has been low on policy and high on countertops. But Beto has finally put forth one vision for his new America: a healed, more perfect union for the El Paso prog-core band the Mars Volta. 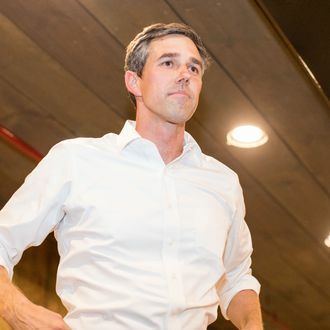 At a recent campaign stop, O’Rourke said, “It would be an honor to have the Mars Volta play anything along the campaign or in this presidency.” O’Rourke has had quite the alternative-boy past, hacking and shredding curb, and playing in a band with At the Drive-In/The Mars Volta’s Cedric Bixler-Zavala. The band was called Foss, which is Icelandic for waterfall. O’Rourke fell in love with punk as a teen in El Paso, specifically the DIY record label Dischord. While touring with Foss, O’Rourke met Feist and received a set of lock-picking tools from her in exchange for getting in to the gig. Bixler-Zavala has not commented on whether or not his more famous bands would reunite for Beto, but maybe Beto could trade a reunion for Feist’s lock-picking kit. Extra Extra! Beto Is Running & His Hand Gestures Are Weird!